Welcome to Canyon, a community of diversity, culture & education! Canyon, TX is a vibrant community known for its quiet neighborhoods and bustling business districts. With many community groups, places to worship and cultural activities, Canyon offers something for the entire family. Canyon offers a small town feel with all the amenities of a bigger city. The Canyon Real Estate market is very dynamic market with price ranges for every buyer. Canyon is also a great area for investment property. West Texas A&M University is in the heart of Canyon. WT is consistently ranked very high for all areas of study and sports and provides a top notch education. Home prices in Canyon remain great with steady appreciation year after year. The Canyon Police force is great and they do a super job keeping Canyon a very safe place to live and raise children. 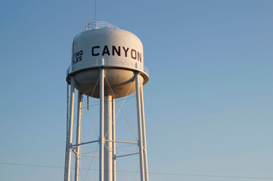 Lyons Realty was founded in Canyon many, many years back and have an office on the square, lets just say that Canyon holds a special place in our company history. Canyon also offers some great attraction for tourist such as the Palo Duro Canyon State Park, the Panhandle Plains Museum and of course Tex Randall. So if you are looking for the small town feel close to Amarillo but without all the traffic then take a look at the Canyon homes for sale.